Back from a business trip to US and UK in connection with my TV channel. Will settle down today, and tomorrow am shooting with the Master Chef team. Later in the week, will be travelling to Delhi for two purposes: launch of my first Lounge Bar Sura Vie and to shoot Part III of my series with CNN. Part I was done in Mumbai, Part II with Chef Rene at his Noma restaurant at Copenhagen. I intend to visit a farm before the shoot, pick up some fresh produce and cook at Sura Vie. The weather is changing for the better, read cooler, in Mumbai. I did realize that the morning is pleasant when I landed. Well, it is not that winter is actually upon us, but definitely a pleasant change from last month’s heat. Some offices have already put up their Christmas trees as an early welcome to the festival. We are arranging a Cake Competition just before Christmas where all the chefs in my team are going to fight it out! Looking forward to some really creative cakes, some baked goodies with a difference! December is also going to give you some chocolate stories that can be written in your kitchen and then presented to your loved ones – cakes, desserts, puddings and what not. 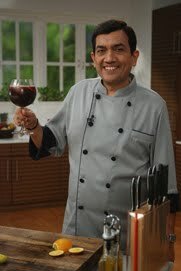 All recipes are on www.sanjeevkapoor.com. Also relish some easy to do snacks that do not require much effort or time to prepare. Every body’s new favourite food, pasta, is also being brought you in all its variations this month, so look out! As the week begins, try some nourishing and comforting recipes for a light dinner. Flew down from Copenhagen to Houston and onto San Francisco to attend the soiree set by Chef Ranjan Dey in this famed New Delhi Restaurant on Ellis street. Recipes from my book How to Cook Indian were served as a part of the dinner menu and the book itself was launched as a fund raising event for the Compassionate Chefs Café (CCC), a no profit organization, founded by Dey in San Francisco. CCC works with the Tenderloin After School Program (TASP) and the Gandhi Ashram in Ahmedabad to provide them with important resources to become members of a global village. New Delhi Restaurant, set up way back in 1988, is impressive. Named one of the finest Indian restaurants in the US by New York Times and it also features on the Galloping Gourmet TV Show. New Delhi has been decorated like a maharaja’s private banquet room and the restaurant serves cuisine made from recipes culled from the royal Indian menus dating back 300 to 400 years using the freshest local ingredients. 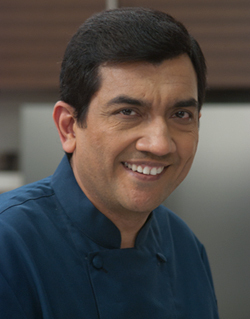 Ranjan Dey is chef and owner, as also star of PBS show ‘My India’. He creates daily specials with his six gourmet spice blends that are marketed under the name of New World Spices. Dey is the caretaker of Indian culture and cuisine in the west, definitely! Off to New York for a couple of days and some more events. Then back home. As the flavour of my trip is to promote Indian cuisine, I will encourage you to get going with some wholesome recipes at home, starting with dinner tonight! In the world of biryani chicken biryani is probably the one that is cooked more often in most homes. If your rice is of good quality, and your spice rack is well stocked, then there is nothing that can stop you from dishing up a fragrant chicken biryani. Chicken is a good quality protein and when combined with rice, herbs, spices and yogurt, it makes a healthy and filling one dish meal. You could of course serve it with kachumber and raita on the side. Only for thing is essential. For a good biryani, chicken or meat or egg or vegetables, time it in such a way that it is served piping hot, fresh from the stove! Boil sufficient water in a deep pan, add three green cardamoms, four cloves, one stick of cinnamon, bay leaves and salt to taste. Boil1½ cups soaked Basmati rice in this till three fourth done. Drain and set aside. Chop 2 pieces of one inch ginger and cut 2 pieces of same size into thin strips. Mix 1 cup yogurt, salt, 5 chopped garlic cloves, 1 ½ teaspoons red chilli powder, and half the chopped ginger and marinate 600 grams chicken pieces in this mixture for about an hour preferably in the refrigerator. Heat sufficient oil in a kadai and deep fry 2 large sliced onions till golden. Drain on absorbent paper and set aside. Heat three tablespoons oil in a thick bottomed pan. Add three green cardamoms, 4 cloves and one stick of cinnamon and sauté till fragrant. Add 2 large sliced onions and sauté till light golden. Add the remaining chopped ginger, 5 chopped garlic, 1 tablespoon coriander powder, 2 teaspoons turmeric powder, 1 ½ teaspoons red chilli powder, one teaspoon garam masala powder and 4 chopped tomatoes. Sauté for about five minutes. Add the marinated chicken and cook on high heat for five minutes. Reduce heat and simmer for ten to fifteen minutes or till the chicken is tender. Add fresh coriander and mix well. Preheat the oven to 180°C. Dissolve a generous pinch of saffron in warm milk. Arrange in alternate layers the cooked chicken and rice. Sprinkle saffron milk, some garam masala powder, ginger strips, fresh mint, fried onions and 3 tablespoons butter in between the layers and on the top. Make sure that you end with the rice layer topped with saffron and spices. Cover and seal with aluminium foil or roti dough. Cook in the preheated oven for ten to twelve minutes. Alternatively you can keep the pan on a hot tawa and cook on low heat for ten to twelve minutes. In case you are looking for more recipes of biryani, try Biryani with Chutney chicken, kachche Murgh Ki Biryani or something lighter like Egg Biryani. Food for the layers: This could be vegetables, chicken, or mutton. For this layer, make sure the meats or vegetables are cooked, tender, ready to eat and are almost dry. The chicken is preferred with bone, in bite-sized pieces. Same for mutton. Cooking: Preheat oven and place the biryani pot. The time of cooking will depend on the amount you are preparing. At the time of service, break the seal or remove the aluminum foil. Or if you are using the slow cooking method on direct heat, place the sealed vessel on a tawa. Try out a beautiful Mushroom Dum Biryani and Handi Biryani. Here’s a peek into the kitchens of the world during Christmas time! Australia: It’s a summer Christmas always! So barbeque time – prawns, steak and chicken, on the beaches ending the huge feast with ice creams and sorbets. Have a taste of Barbequed Chicken. Czech Republic: As a tradition (and an auspicious event) people sit in even numbers for dinner which can be fish soup, salads, eggs and carp. Finland: It is customary to see casseroles of macaroni, rutabaga, carrots and potatoes, with ham or turkey or a mixed platter of meat and fish. Germany: The popular poultry is still goose, roasted whole and served with potatoes, cabbage, carrots, parsnip and pickles. However, rural southern Germany still relishes wild boar and venison on Christmas day. Greenland: The traditional Christmas dinner recipes may include ‘kiviak’: little seabirds named auks that are a bit like penguins, wrapped in sealskin and they are buried whole in this sealskin for several months till they reach an advanced stage of decomposition. Considered a delicacy. Other foods that are enjoyed are soups and stews, barbequed fish, or even raw fish. Baked apples and berried with crisp toppings and Danish pastries form the desserts. You could try out a simple Apple Crumble at home. Italy: An Italian Christmas lunch is a leisurely seven course feast: antipasto, a small portion of pasta, roast meat, two salads, two sweet puddings followed by cheese, fruit, brandy and chocolates. Jamaica: The traditional Christmas dinner is rice, peas, chicken, ox tail and curried goat. Portugal: A special meal includes salted dry cod-fish with boiled potatoes eaten at midnight on Christmas Eve. Russia: Christmas delicacies include cakes, pies and meat dumplings. South Africa: It is the hot summer season during Christmas but they traditionally have a turkey dinner with all the trimmings. Sweden: A super buffet for Christmas boasting of varieties of shellfish, pork, cooked and raw herring fish, caviar, cheese and brown beans. United Kingdom: Christmas Pudding and Mince Pies are top of the list. A Christmas luncheon with family and friends will have turkey, roast vegetables, sausage and bacon. With the two favoured desserts even chocolates are generously passed around. USA: With its multi cultural population, there is nothing specific as a Christmas feast. However, in small towns and rural America, goose, turkey, a variety of vegetables, squash, and pumpkin pie are traditionally eaten on Christmas day. Families from Western European origins enjoy turkey or ham with cranberry sauce. Families from Eastern European origins have a larger spread with turkey and its trimmings, keilbasi (a Polish sausage), cabbage preparations and some soups. It could be Christmas lasagna for some Italian families! Something like Spinach and Mozzarella Lasagna could interest you! India cuisine – Top of the world! India is a geographically rich country. The world’s most recently formed and still rising mountains, the Himalayas are the crowning glory with the world’s most ancient rocks in the Peninsula adding wealth to the southern part of the country. We also have the world’s wettest place at Chirapunji and the hottest desert in Thar. Interestingly, the tapestry of Indian culture also weaves in some colourful threads of variety of cuisines. It cannot be gainsaid that in India if you begin to taste a new dish everyday it will take quite a few years before you will have exhausted the entire repertoire of Indian food! That’s India cuisine for you! Indian food has been synonymous with curries and sweetmeats. In the subsequent articles you will get a chance to savour the hot, tart, sweet and tangy notes that make up the melodious symphony of India cuisine. It will also be a sincere attempt to present easy to cook recipes so that the myth that Indian food is elaborate to cook can be put to rest. Creativity has surely built a home in India. Given the availability of limited basic ingredients, the diversity of preparations is a surprise. The northern and western parts of the country have wheat as the staple cereal. Mustard oil is a popular cooking medium in the north and east and groundnut oil in the west. The people of southern and eastern parts relish rice. Most of the cuisine in the southern parts makes good use of sesame and coconut oil. A range of spices in a variety of combinations put a distinct stamp of flavour to the regional recipes. 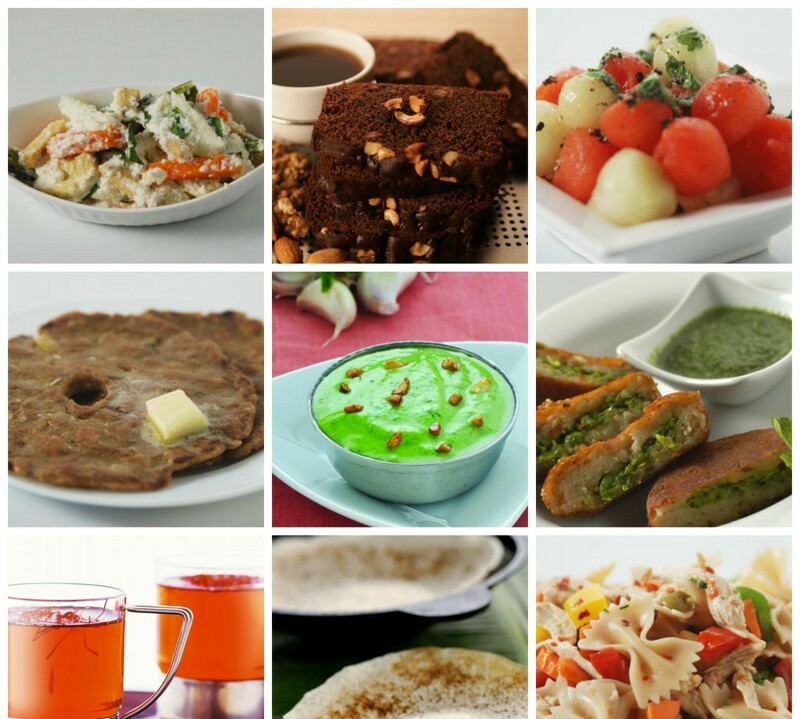 India cuisine is more popular for its wide variety of vegetarian dishes, which depend on the seasonal availability. Dal is a must almost all over the country. Fish, mutton or chicken are the more popular non-vegetarian dishes of which too there is a considerable variety. A meal is generally accompanied with curds, either in the form of raita or eaten plain. This is mostly to combat the other spicy dishes plus aid in digestion. Another integral part of an Indian meal is the stupendous variety of pickles – both hot and sweet. As we leave you with these mouth watering notes, let us get back following week with more highlights of India cuisine.